As an aluminum extrusion company, we hold aluminum close to our hearts, so we thought we’d pass along some fun ideas so you can give the gift of aluminum this Christmas! Aluminum is pliable, plentiful, strong, lightweight, easy to combine with other materials, heat resistant, non-corrosive, a great conductor of electricity, and 100% recyclable. What’s not to love? 1. Golf clubs – Aluminum shafts mean faster swing, increasing distance with each shot. 2. Watch – Did you know they even have aircraft-grade aluminum watches? 3. Dutch oven – Lightweight, rust-proof, & easy to clean. 4. Money clip – Get it hand-stamped or engraved. 5. Fountain pen – Sleek, durable, classic. 6. Tie clip – Simple, fashionable, timeless. 7. Aluminum tumblers – Brighten up the BBQ or picnic with colorful retro tumbler cup set. 8. BBQ Set – Aluminum BBQ grill, or grill accessories… for the perfect outdoor meal. 9. Wind chimes – Add harmony to the home or garden with the gentle lullaby of chimes. 10. Waffle iron – How ‘bout a cast aluminum stovetop waffle maker? 11. Kaleidoscope – A unique gift for a very special someone who brings color to your life. 12. Bicycle – For the child, the athlete, or the leisure-seeker. 13. Ladder – Foldable step-stool for the kitchen or a ladder for indoor/outdoor tasks. 14. Mailbox – Secure, weather resistant, heavy-duty aluminum for curbside appeal. 15. Ski poles – Sturdy aluminum poles make the most sense. 16. Refrigerator – Kitchen trends come and go, but aluminum appliances are steadfast. 17. Salt & pepper shakers – Go vintage or go modern, everyone uses salt & pepper shakers. 18. Toaster – Toaster or toaster oven, forever a useful gift. 19. Bottle stopper – Stylish, sophisticated, practical, and you can personalize them. 21. Fishing boat – Aluminum is the ideal solution for boaters seeking inexpensive versatility. 22. Office chair – Enhance comfort & style at work or in the home office with a new chair. 23. Espresso maker – Everyone knows life is better with coffee drinks. 24. Cufflinks – Add a touch of class and a splash of color with polished aluminum cufflinks. 25. Coasters – Handcrafted or engraved, the table is protected and the drinks are stylish. 26. Speakers/Bluetooth speakers – Turn up the soundtrack and get celebrating. 27. Martini shakers – Sharpen bartending skills and cocktail endeavors. 28. DVDs & CDs – We all have an album or a movie that we need to hold in our hands. 29. Jewelry tree – A perfect way to display necklaces, bobbles and bangles. 30. Baseball bat – Or softball bat, to hit the fast pitches and curve balls. 31. Serving utensils – Serve in style & get savory dishes from pan to plate. 32. Computer – Did you know computers contain aluminum micro-extrusions? 33. Patio furniture – Outfit an outdoor living space with durable cast aluminum furniture. 34. Window frame – New windows? Another item made with aluminum extrusions. 35. Flag pole – To honor, remember, or show holiday spirit far and wide. 37. Camping equipment – Make it easy to spend the weekend outdoors. Prepare ahead. 38. 6-pack ‘o beer – Or someone’s favorite soda pop. 39. Pots & pans – Cook like a pro with anodized aluminum pots & pans. 40. Car rims – Nothing says “I love you” like a set of rims. 41. Umbrella – A simple and thoughtful gift that comes in every imaginable design & color. 42. Aluminum sculpture – How about the perfect artistic sculpture for your loved one? 43. Bangle bracelets – All the rage right now, the more the merrier. 44. Customizable license plates – Oh, how clever you can be. This gift goes everywhere. 45. Keychain – Stocking stuffer, office gift, or customize something special. 46. Aluminum water bottle – Keep it cold, keep it hot. 47. Bottle opener/Corkscrew – A thoughtful gift for your favorite wine lover & host. 48. Beverage tub/Wine chiller – Keep your drinks cool at your next BBQ or event. 49. Picture frame – Put a past memory in the frame or take a new pic! 50. Luggage – More air miles than ground miles? A durable aluminum suitcase is a must. … and don’t forget to wrap your gift in aluminum foil, topping it off with a great big, pretty bow! (If you really want to go all out, that is.) 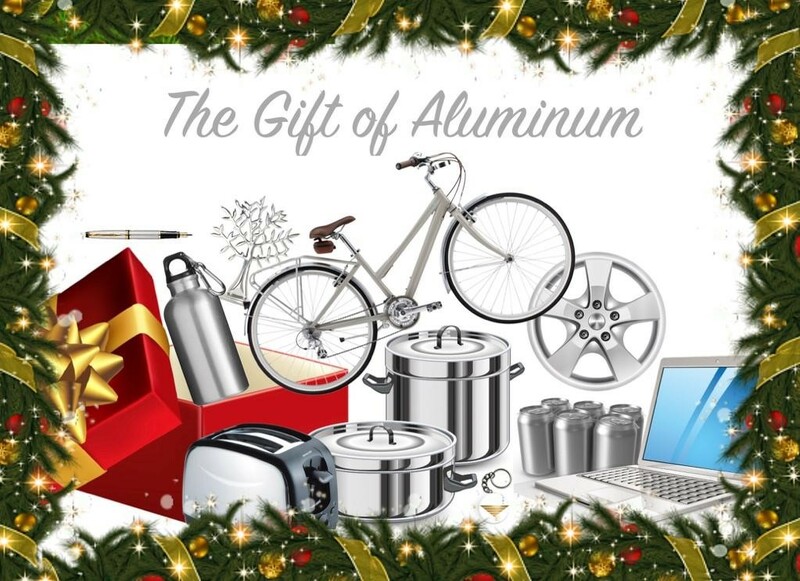 Aluminum symbolizes the ability to weather life’s ups and downs, and the holidays are a time to recognize how far we’ve come and share future hope with friends and family. May your holiday be filled with joy, laughter, peace… and aluminum. Taber Extrusions has extrusions in the name, but it’s really a full-service aluminum extrusion company. Taber controls it all, from the casting of the billet, the extrusion process, fabrication and finally the logistics..
We have a commitment to meeting and exceeding customer expectations by providing both products and service levels that are of the highest quality. This commitment is at the core of our operating philosophy. For us, these unique capabilities are key. Our specialty is the manufacturing of complex and intricate extrusions which competitors consider difficult or even impossible. Our full range of extrusion presses, from 1800 and 3000 ton to our impressive large 8600 ton, give us unmatched flexibility and profile capabilities to meet our customer’s needs. For example: our 8600 ton press, one of the largest extrusion presses in the United States, has the capability to extrude both 16 and 20 inch round billets, and 10” x 28” rectangular billets with a maximum circle size of 31” and up to 140 lbs. per foot. With the ability to extrude large, intricate configurations, such as lightweight but strong one-piece extrusions, the customer can incorporate whole assemblies of small components into one extruded part. As your full-service aluminum extrusion company partner, Taber will work alongside you to turn a concept into reality. Taber’s remarkable attention to the needs of the market position us to provide customized, versatile, high-quality extruded and fabricated products that can satisfy a wide range of applications. 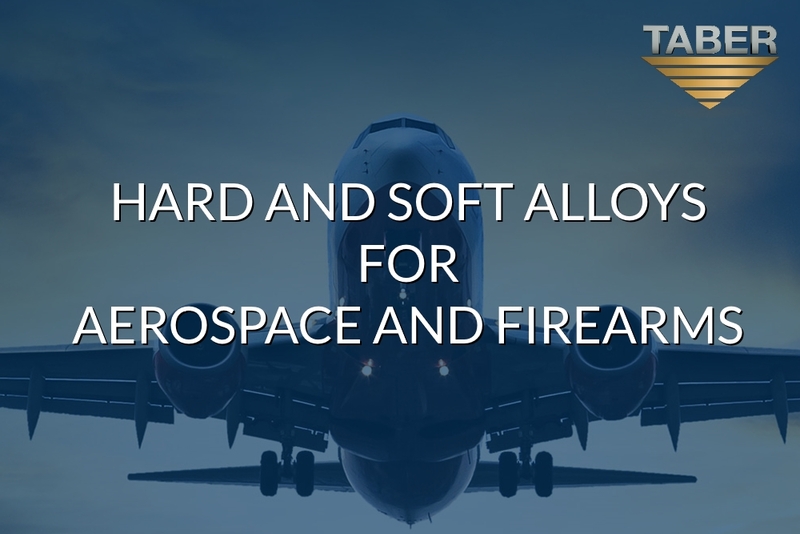 Taber is able to offer both hard alloys as well as soft alloys for aerospace and firearms, which is fairly unique in the industry. One of the most exciting segments in the hard alloy group is firearms. We have discovered that many firearms manufacturers are small businesses. So, what we offer is stocking a custom shape for them, or producing a generic shape that they can machine individually into their own profile. We provide a solution not only to large businesses, but to any small business too! 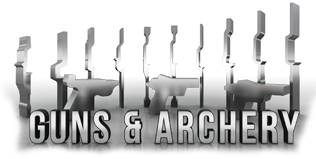 We’re also able to offer distribution centers and larger manufacturers of firearms the exact near-net shape that they need. Furthermore, in regards to the alloys for aerospace market, we supply all of the major manufacturers in the US. We do large press hard alloy extrusions, which is for a very limited supply market and provides additional value to our customers. We’re very unique in that aspect. Aluminum alloys have long been a dominant material in the manufacture of aerospace vehicles, and due to the ever-evolving nature of aluminum alloys, they are likely to stay around for a long time. Taber offers the full range of aluminum alloys for all of our aluminum shapes, including hard, soft, marine, and armor grade alloys. Need specific material or alloy? We can offer custom chemistries to meet your unique needs. All of our alloys are processed at our billet casting facility in Gulfport, Mississippi. In a five-billion pound industry, Taber is among the leading aluminum suppliers and is the most diverse in breadth of capability. Learn more about Taber’s Available Aluminum Alloys here. 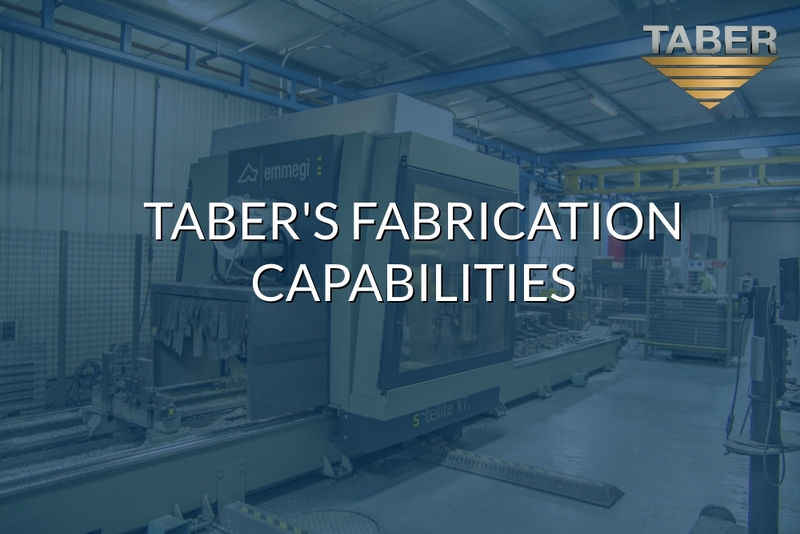 Taber’s updated fabrication facility in Russellville, Arkansas is designed to handle fabrication and machining as always, but now boasts tremendous growth in manufacturing parts for cutting-edge technologies. This expansion includes applications in electric transportation vehicles for individual and mass transit transportation. With the ongoing support of our parent company National Material L.P., we have the opportunity to expand into areas that were previously unreachable. CNC machining is used extensively by aluminum extrusion companies to increase efficiency, reduce error, and move the solution toward a final product the customers desire. Our mission is to fully understand the machining needs of our customers’ aluminum extrusion-based products. Taber’s remarkable attention to the needs of the market position the company to provide customized, versatile, high-quality, market-oriented products that can satisfy a wide range of applications. The Haas VF-7 is our large-sized VMC that provides reliability and pinpoint accuracy. The VF-7 has a 40-taper cartridge spindle driven by a 30 hp vector Dual-Drive (Y-Delta) drive. The VF-7 produces either 75 ft-lb of torque at a low 1400 rpm, or 250 ft-lb at 450 rpm with the optional 2-speed gearbox — and will also run up to 8,100 rpm in 1.2 seconds for finishing aluminum. Our Emmegi Satellite XT allows for efficient workpiece aluminum machining advantages in pendulum mode including multiple set-ups. It’s a five-axis machining center and it allows us to machine, complete, a 10 ½ meter long part. It also has sawing capabilities where we can square cut and compound mitre cut parts to length. The work space of our long-bed machining center can be divided into two areas, granting us the ability to load and unload on one side while machining on the other side. The HMC500 comes fully loaded with features for fast cycle times. The HMC500 is constructed with a lightweight column featuring a rigid stepped X axis rail design. This column enables a rapid feed rate of 63 meters per minute, 2480 inches per minute, with acceleration of 1G. The Zeiss CMM uses highly accurate scanning technologies to capture a fully defined 3D measurement for any of our extruded and fabricated profiles. In the industry, and wondering what it’s like to work for an aluminum extrusion company like Taber? We like to think that what sets us apart goes beyond just our expanded capabilities; It’s the tight-knit company culture we have cultivated along the way that has enabled us to become the benchmark competitor in the Aluminum Extrusion Industry. Over the years, we have been blessed to work with a team of good-natured, hard-working, and dedicated group of individuals. Here’s what our VP of Sales and Marketing, Allan Bennett, has to say about the reception he’s received at Taber since joining two and a half years ago. As Taber continues to expand its scope and tap into the ever-developing aerospace and infrastructure industries, we couldn’t be happier to have a team like ours to back us up. We encourage you to choose Taber Extrusions as your full-service partner. If you would like to learn more about our capabilities, or learn about Taber in general, give us a call at 888-985-5332. Since 1973, Taber Extrusions LLC has pioneered the extrusion of large, heavy and wide complex shapes to differentiate itself in the aluminum extrusion industry. Since its inception, the brand name Taber Extrusions has been synonymous with innovation, service and quality—all of which serve to make Taber Extrusions the premiere Aluminum Extrusion company. All of our extrusions have, and will continue to be engineered, manufactured and tested in the United States. Taber Extrusions maintains its headquarters at the Russellville, Arkansas facility, with a regional sales office at its Gulfport, Mississippi facility. Today, Taber Extrusions continues to expand upon its operations and capabilities to retain the cutting-edge service that the company is known for and the aluminum extrusion industry deserves. Our recent aluminum cast house renovations now allow us to create aluminum billets in 8”, 9”, 11”, 16”, and 20” sizes, along with a 10” x 28” rectangular billet used only in-house on Taber’s 8600 ton press. This gives Taber the capability to produce those ultra-wide extrusions. We have unmatched access to the full range of aluminum alloys, without having to go through a middle man. Because Taber controls our billet casting, we have greater flexibility in our casting chemistry. We also continue our production of a wide range of aluminum extrusion sizes and shapes. Our aluminum extrusion capabilities utilize both hard and soft aluminum alloys—the kind found in aerospace, marine and military applications. The company’s profile capabilities range from industry standard extrusions to intricate custom designs that meet specific needs. Our standard shape catalog includes rods, hollows, channels, beams, angles, tees, zees, and bars in a wide range of sizes. After all this time, why do our customers continue to return to Taber? It’s because we’re dedicated to innovation. We’re dedicated to finding intricate solutions for even the most complex extrusion request. While other Aluminum Extrusion Companies continue to focus on standard products and techniques, Taber’s work ethic and attention to the needs of the market allow Taber to create customized, versatile, high quality and market oriented products that can satisfy a wide range of applications. Since 1973, Taber Extrusions LLC has pioneered the extrusion of large, heavy and wide complex shapes to differentiate itself from the typical aluminum extrusion company. Since its inception, the Taber Extrusions brand has been synonymous with innovation, service and quality. All of our extrusions have, and will continue to be engineered, manufactured and tested in the United States. Taber Extrusions maintains its headquarters at the Russellville, Arkansas facility, with a Gulfport, Mississippi facility that includes a regional sales office, aluminum cast house and extrusion operations. Today, Taber Extrusions continues to expand upon its operations and capabilities to retain the cutting-edge service that the company is known for. Our recent aluminum cast house renovations now allow us to create aluminum billets in 8”, 9”, 11”, 16”, 20”, and slab sizes. We have unmatched access to the full range of aluminum alloys, without having to go through a middle man. Because Taber controls our billet casting, we have greater flexibility in our casting chemistry. We also continue our production of a wide range of aluminum extrusion sizes and shapes. Our aluminum extrusion capabilities can now utilize both hard and soft aluminum alloys, of the kind found in aerospace, marine and military applications. The company’s profile capabilities range from industry standard extrusions to intricate custom designs that meet specific needs. Our standard shape catalog includes rods, hollows, channels, beams, angles, tees, zees, and bars in a wide range of sizes. After all this time, why do our customers continue to return to an aluminum extrusion company like Taber? It’s because we’re dedicated to innovation. We’re dedicated to finding intricate solutions for even the most complex extrusion request. While other extruders continue to focus on standard products and techniques, Taber’s work ethic and attention to the needs of the market allow Taber to create customized, versatile, high quality and market oriented products, that can satisfy a wide range of applications. Want to get in touch with Taber? Our contact information can be found in the link below. In 1973, Taber Extrusions pioneered the extrusion of large, heavy and wide complex shapes to differentiate itself in the aluminum extrusion industry. Today, Taber Extrusions continues its tradition of breaking boundaries as an aluminum extrusion company that is a leader in the production of a range of quality aluminum extrusions sizes and shapes. The name “Taber Extrusions” has been synonymous with innovation, service and quality. … but Taber is much more than a leading aluminum extrusion company. Taber is a company powered by heart, conscience, and deep ambition. 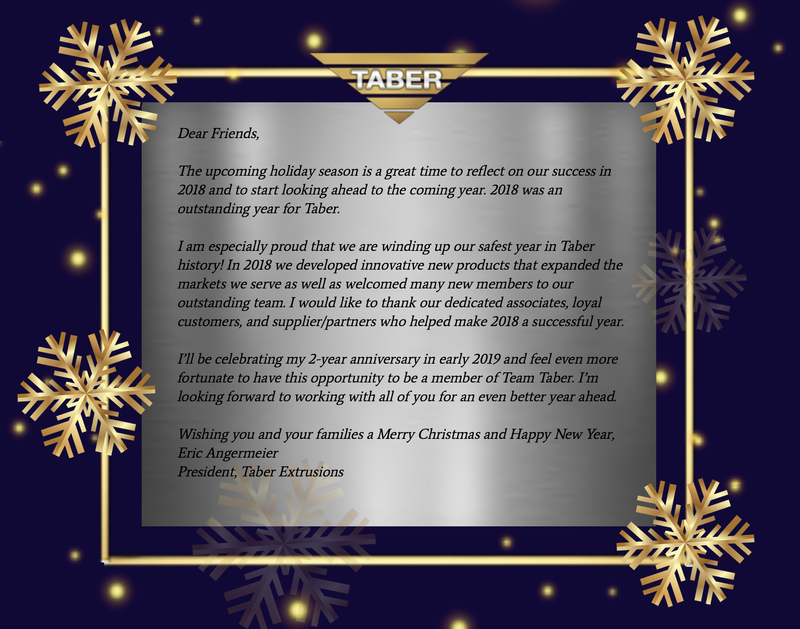 Taber understands that employees are customers, too. Taber exerts just as much effort in attracting, engaging, and retaining their employees as they do for their customers. Promoting a philosophy of “group achievement” has always been a primary focus, and this approach makes for longtime careers. Meet forklift operator Arthur McCann, employed by Taber’s Gulfport, Mississippi facility for over 40 years. When an entire aluminum extrusion company focuses on consistent delivery, exceptional service, dependability, and innovation, mutual rewarding is the result. Michael McDonald is the Co-Plant Manager for Taber’s Russellville, Arkansas location. 13 years ago, Mike applied to Taber as a temp, and was hired on full time within a few months. “The future for Taber isn’t written yet, but I see a very long and prosperous one. Taber has had a very big impact on the industry in its 44 years. We are continuing in our research of new technology and the possibilities of applying that technology or technique to our unique capabilities, so I think as long as we continue with what has made us successful, and continue to improve those areas, the sky is the limit for Taber Extrusions.” Read more about Michael McDonald. If you are interested in having Taber Extrusions as your full service partner or would like more information on Taber in general, give us a call at 888-985-5332. You can also acquire details on Taber’s MBE supplier for aluminum extrusions status and commitment to creating diverse partnerships by visiting the MBE supplier for aluminum extrusions page of our website. Following our “Aluminium Extrusions 101” post, we wanted to share an animation of the process from Core Materials. The animation illustrates a complete cycle of aluminium extrusion production, including die heating and transfer, billet heating, sawing, transfer to press, extrusion, cooling, sawing, stretching, stacking and ageing, and was developed and released by Sapa AB and Materials e-Learning Technologies under a Creative Commons Attribution-ShareAlike 3.0 unported license. Watch the video and learn more about aluminium extrusions.